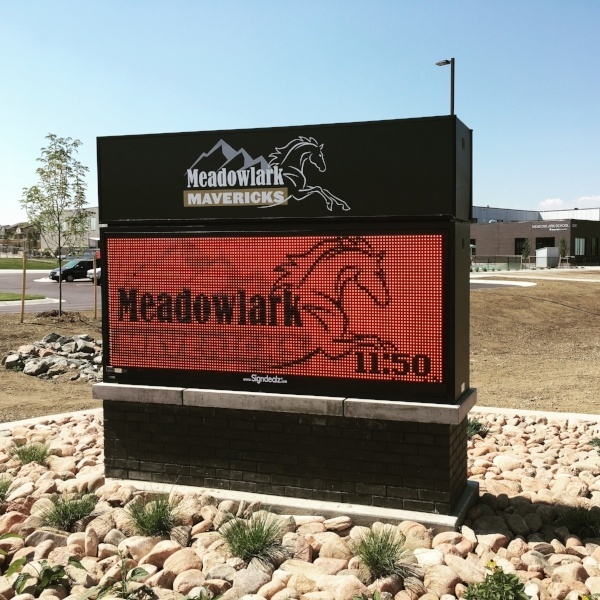 Signdealz delivered on it's latest LED sign in August to Boulder Valley School District's new Meadowlark PK-8 School. The 3'H X 8'L double sided 19MM Monochrome Watchfire Signs LED Display will help parents and teachers stay informed for years to come. Signdealz partnered with FCI Construction for the design build of the new monument sign. 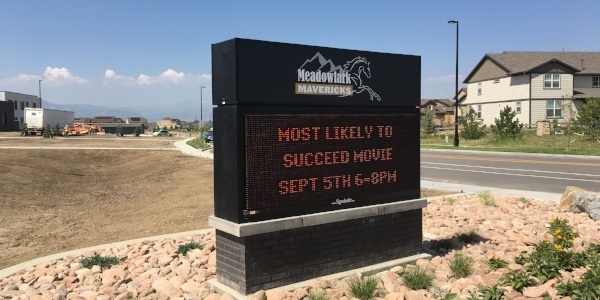 Signdealz has done 8 previous signs for BVSD, and this sign was the latest school to get the award winning Watchfire Sign technology. The sign uses a 4G Broadband antenna, allowing the school district to connect to the sign from anywhere with internet access. The sign can also be remotely diagnosed by Signdealz and Watchfire Signs, saving the school district hundreds of dollars on maintenance over the years. Meadowlark's sign also includes a new LED illuminated sign cabinet with their new logo. Our signs include all aluminum construction, which will allow the sign to last for decades. All Signdealz signs come with 5 years of parts warranty and 2 years of labor warranty. We also provide complementary on site training with all LED Signs sold by Signdealz. We only sell the best Watchfire LED Displays, manufactured here in the United States. Our goal at Signdealz is to provide cost effective quality sign solutions for small and medium sized business and government clients with award winning customer service. If you need a new sign at a great price, call Signdealz at 800-405 -0686.